As of June 2017, Microsoft made a change to explicit block in XlstListViewWebPart the rendering of custom HTML markup in Calculated Fields: Handling HTML markup in SharePoint calculated fields: "Some users have added HTML markup or script elements to calculated fields. This is an undocumented use of the feature, and we will block the execution of custom markup in calculated fields in SharePoint Online from June 13, 2017 onwards. The June 2017 Public Update (PU) and later PUs will make blocking a configurable option for on-premises use in SharePoint Server 2016 and SharePoint Server 2013." In the article, Microsoft states that for SharePoint on-premises (2013 version and later) one can restore to the previous behavior through a new property on webapplication level: CustomMarkupInCalculatedFieldDisabled. 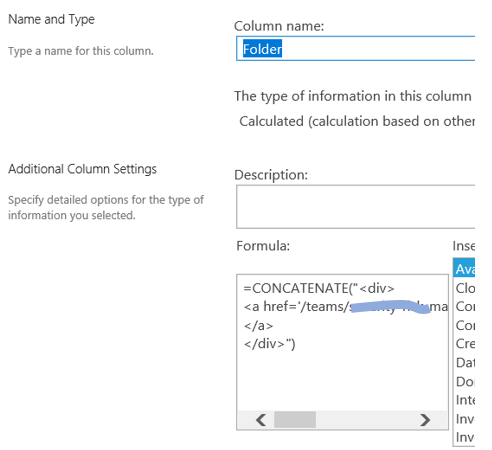 For SharePoint Online there is no such configuration option provided. A bit by coincidence (and also by mere perseverance ), I detected an alternative - undocumented - approach that does not require an overall webapplication setting. And as bonus, likely also works in SPO context. 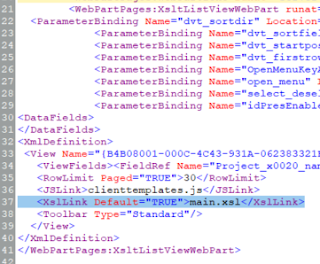 Default the XslLink property in XsltListViewWebPart XmlDefinition is configured via the View property: SPView.XslLink. The essence of the workaround / approach is to make use of the Xsl-behavior in the superclass of XsltListViewWebPart: DataFormWebPart. If you specify Xslt transformation at that level (either via XslLink, or via Xsl property), then you can configure for single XsltListViewWebPart instance that custom HTML markup of Calculated Field is still executed. 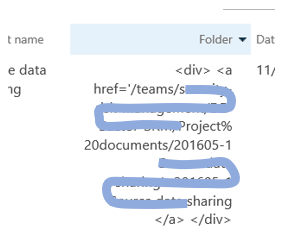 Although undocumented, it is an own Microsoft source that helped me discovering this => the SharePoint Escalation Service Team Blog - Guidance for XslLink property with the XsltListViewWebPart: "There exist other alternatives to let the XsltListViewWebPart use your XSL Transform. " Note also that when you used 'Design' mode in SharePoint Designer 2010 to customize the Xslt-rendering of a list column, the customized Xslt-template is also injected in the Xsl property on webpart level. 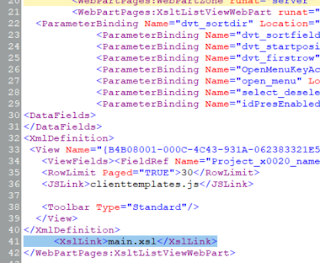 Thing to be aware of: with using the 'XslLink' property it is a prerequisite that the applied Xslt stylesheet file is located in the layouts folder (see: Guidance for XslLink property with the XsltListViewWebPart: "however you would need to place your XSL file in the default “_layouts/xsl” folder"). In the above scenario that is guaranteed as I simply refer to the standard 'main.xsl' stylesheet that is by Microsoft itself provisioned in the layouts folder, both on-premises as online. If however you need a deviation from the standard XsltListViewWebPart rendering, then you need to provision your own custom Xsl stylesheet thus also in the layouts folder. Which in SharePoint Online context is of course not possible. If the deviation is only minimal, e.g. to override the standard rendering for only one column, then I advise to make use of the 'Xsl' property instead, and only include in it the overloading 'xsl:template'. On occassion I participate in several IT forums, for posting questions, issues and answers. I commonly use 'WvStrien' as my forum alias. Click here for searching my forum postings.